About 10 years some clever gem burners in Thailand discovered that heating corundum with the light element beryllium could make weak colored sapphires more attractive. 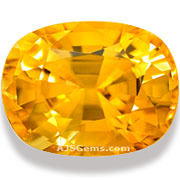 Pale yellows, brownish and green sapphires could be enhanced to vivid yellow and orange. Dark blue sapphires could be lightened to a cornflower blue. And some pinkish sapphires could be treated to produce a color close to the coveted padparadscha. When these treated sapphires first appeared on the market, the treatment was not disclosed. It took some serious detective work by the world's best gemologists to determine that the color had been enhanced by diffusing beryllium into the crystal lattice at high temperatures. They discovered that the color produced by this enhancement reached deep into the gem, unlike earlier forms of diffusion which colored only a thin layer at the surface. Gemologists labelled this new treatment lattice diffusion. You will also sometimes see it referred to as "beryllium diffusion." 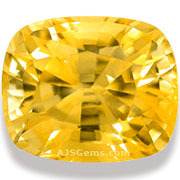 Lattice-diffused sapphires are now common in the market, especially in the yellow color range where the treatment is able to produce sapphires with a vivid yellow that is very rare in nature. The treatment is stable and permanent and gems treated by this method require no special treatment. 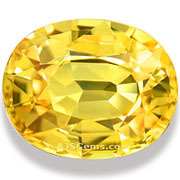 However, it is an enhancement to the natural material, and thus treated gems sell at a lower price. Because untreated gems are more valuable, it is essential for jewelers and collectors to know whether a gem has been treated using this method. But it is not just a question of the dealer's honesty in disclosing the treatment, since he may not know whether a particular stone has been treated. The fine gem business depends on testing techniques developmed by leading gemological labs in order to detect lattice diffusion and identify natural sapphire. Because the light element beryllium cannot be detected using standard spectrometers, a laser must be used to take tiny samples of the material, which are then vaporized and analyzed by a special spectrometer. The devices used to do this are known as LIBS (Laser Induced Breakdown Spectrometer) and LA-ICP-MS (Laser Ablation Inductively Couple Plasma Mass Spectrometer). Very few gemological laboratories can afford to buy and maintain this equipment. Labs that can detect beryllium treatment include GIA (Gemological Institute of America), GRS (GemResearch Swisslab) and GIT (Gem and Jewelry Institute of Thailand). Reputable labs that cannot test for beryllium treatment, such as AIGS (Asian Institute of Gemological Sciences), will put a note on their sapphire test reports that reads "Not LIBS tested." This indicates that the gem has not been tested for lattice diffusion treatment. The most important thing for consumers to know is that any sapphire which has been heat treated may have been beryllium diffused as well. Only a gemological laboratory with the right equipment can determine if that is the case. Even a well intentioned dealer can easily be mistaken about sapphires in his inventory, since he may have received incomplete information from his supplier. Since only a small number of gemological labs can test for beryllium, insist on a certificate from a capable lab before purchasing a sapphire for your collection.